Well, I finally figured out a way to drink chorizo! A few months ago I was checking out restaurant menus while making weekend plans, when I noticed a bacon-infused cocktail featuring "housemade" bacon vodka on one of them. It's not the first time I'd seen bacon cocktails, but it was the first time I started to think about the technique involved in making booze taste like meat. I did a little research and learned about a process called "fat washing," wherein a substance that has solid oils in it (like bacon, brown butter, or duck fat) is soaked in alcohol. The alcohol pulls out the oils (and accompanying flavors). You then freeze it to harden the fat, and strain. What you end up with is a spirit infused with the flavors of whatever fatty delicious thing it is you soaked in the booze. I love a negroni cocktail. It's boozy and strong and bitter and elegant. I love when it catches the light (whether sunshine or candlelight) and shimmers in my hand like a jewel. I like that it matches my usually red nails and usually red lips. It's one of my go-to pre-dinner drinks (the other is a French 75), and I have specific requests about how I prefer it (a smidge more gin than vermouth, a lemon wedge or two on the side, a dash of orange bitters if they have them). Another thing that I love is chorizo. This should come as no surprise given the fact that a full 20% of the recipes on this blog feature chorizo. I went through and did the math on this. Something about the combination of smoke, spice, and fat that totally thrills me. If there is something with chorizo on the menu, I will order it. And there are few savory dishes that I think couldn't be improved with a little bit of chorizo. With my new knowledge, I set about combining these two things that I love. I started out by making a batch of chorizo-infused gin. I sliced up a cup of dried aged Spanish chorizo and adding it to a couple cups of Plymouth gin. I covered the bottle and let it soak overnight at room temperature. In the morning, I popped it in the freezer for an hour, then strained out the little globules of solid fat through a paper towel. The resulting gin smelled smoky and savory and had slight golden hue. 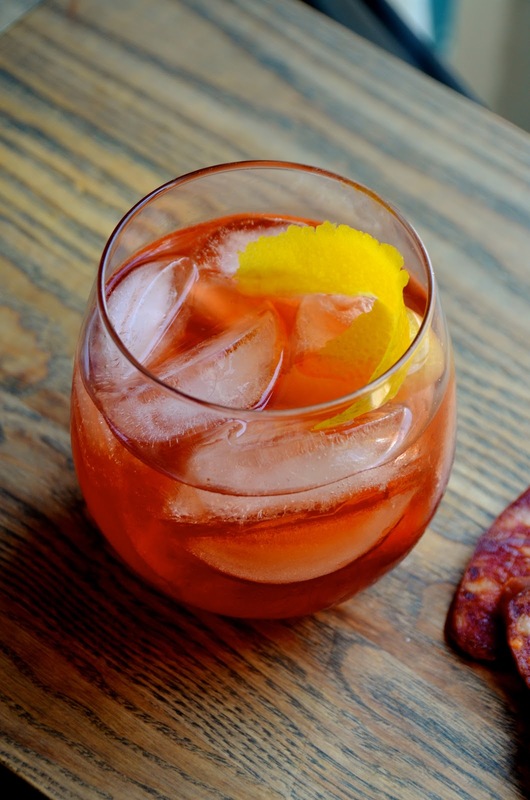 I mixed it up into a classic Negroni (equal parts gin/Campari/sweet vermouth) and garnish with orange peel and another slice of that fab dried chorizo. Holy heck was it ever magical! The drink hit all the flavor notes--bitter, salty, sweet, smoky, spicy. I made and photographed them around 2PM and then not much productive happened after that. Not sorry. Cilantro Daiquiri! This tangy daiquiri is served on the rocks and perfect for hot summer afternoons. Nicaraguan Macua cocktail. Guava is the secret to this lush tropical cocktail. Fresh Ginger Margaritas. If you love spice, you will LOVE these ginger margs. Perfect all year long. 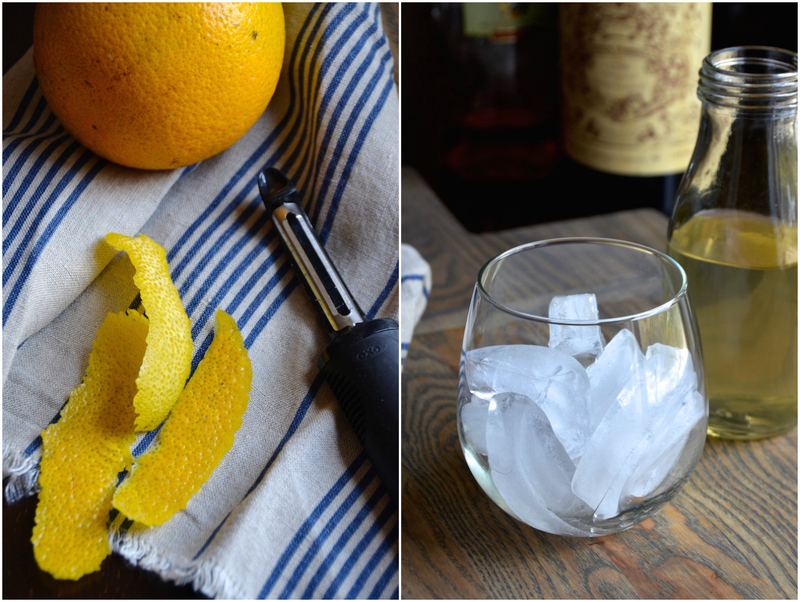 This chorizo infused gin takes about 24 hours to make (though only a couple minutes of hands-on prep on your part), so plan ahead. This batch will give you enough for about 16 cocktails and will keep well for pretty much ever. 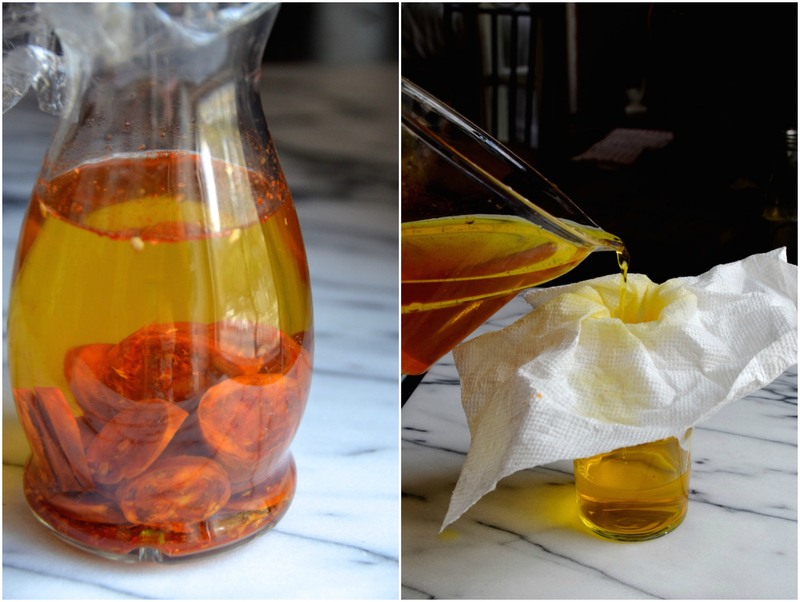 Combine the 2 cups gin and 1 cup sliced chorizo in a large glass mason jar or carafe. Cover and let sit at room temperature for at least 8 hours or overnight. Strain infused gin through a fine cheesecloth or paper towel set over a mesh strainer and bowl. Transfer the strained gin to a bottle. 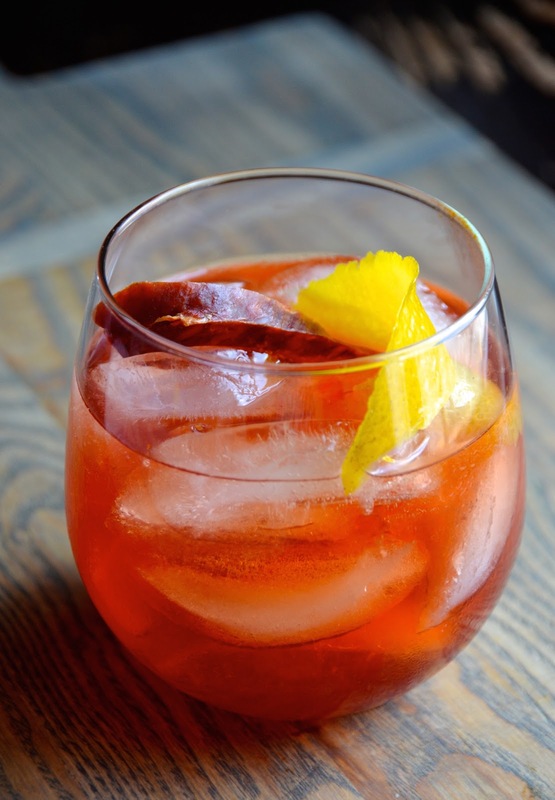 To make the cocktail: combine 1 ounce each of the chorizo-infused gin, sweet vermouth, and Campari in a glass. Add ice and garnish with orange and a slice of chorizo. Serve immediately.